Stella McCartney, Raeburn, Bottletop and Outland Denim have today been declared the sustainable innovators-to-watch by the CO Leadership Awards, a prestigious new award campaign launched by sustainable business networking platform Common Objective (CO) to recognise the leaders and disruptors in the sustainable fashion space. The Awards champion fashion businesses that push boundaries, blending beautiful products with business practices that change lives and tackle our urgent environmental challenges. The panel of judges is a Who’s Who of British fashion, including Caroline Rush, Chief Exec, British Fashion Council; Dylan Jones, Editor of GQ; Clare Press, Sustainability Editor, Vogue Australia and Orsola de Castro, co-founder of Fashion Revolution; model Amber Valletta and Sustainable Sourcing Specialist for Kering, Christine Goulay. In an industry first, the whole supply chain is considered: from suppliers to brands, communities to organisations. “What we’re trying to do with the awards - and with CO in general - is to enable people to find those who, like them, want to do things better. And we want them to get the sense of what is possible so that they think, ‘I can do that too,”” says Clare Lissaman, CO Director of Product and Impact. Business practice became a focus “[because] it’s about how business behaves that makes the difference,” says Lissaman. Accordingly, entrants were grilled on a set of criteria that spanned business and sustainability - mission, business model, products/services, impact, and roadmap - do demonstrate that they are commercial, design led, fit for market and that they take social and environmental responsibility seriously.. Some of the women who work at Ethical Apparel Africa (EAA). The landscape for sustainable fashion is changing - and it’s changing fast. And the Leadership Award winners are leading the charge. But, even a brand doesn’t give a single use coffee cup about people, planet and animals, it will probably care about profit. “We’re certainly seeing a greater response from the leaders,” muses Lissaman. “Some of the more established businesses are looking at new brands like Allbirds and Veja and asking how they have gotten successful so quickly - and they’re recognising that some of that is about sustainability. Like Outland (read my interview with founder James Bartle here). They’re another brand proving that design and commerciality and quality can work together and who are blowing people out of the water,” says Lissaman, approvingly. What makes the awards impressive is the comprehensiveness of its regard. We may not be surprised that luxury leaders such as Stella McCartney, Bottleto and Raeburn have scooped prizes or that more niche but equally pioneering brands such as Mayamiko and Brazillian label Osklen have done well. We may, however, be moved by the recognition of Ethical Apparel Africa (EAA), a network of production facilities throughout Africa, or the world’s first vertically integrated Fairtrade organic cotton supplier, The Rajlakshmi Cotton Mills. Their presence reflects the growing - and necessary - recognition of the people who make our clothes, launched by Fashion Revolution’s powerful #whomademyclothes campaign and, before that, by the 1,134 people who lost their lives in the Rana Plaza collapse. Raeburn - A British luxury upcycling brand synonymous with design-led upcycling of unconventional materials. Ethos of Remake, Reduce, Recycle. Osklen - A Brazillian luxury brand, experimental and innovative in it’s approach, with a vision to make Brazil a sustainable development innovation hub. Stella McCartney - A British luxury brand, data-driven in their sustainability and innovation. Leader of the global sustainable fashion movement. Bottletop - Accessories brand founded through a design collaboration with Mulberry. Supports artisan makers in Brazil, and educates young people through their foundation. Indigenous - An established US lifestyle brand, that invests in 1,000+ Peruvian artisan workers by providing microfinance. Outland Denim - An Australian denim brand championed by the likes of Meghan Markle. Made from 100% organic cotton, their production offers employment and training to vulnerable women. Mayamiko - Made in Malawi urban youth brand, Mayamiko takes ‘made in Africa’ to the masses. Provides training to local garment workers. Sonica Sarna Design - High-end artisan producer, including clients such as Mara Hoffman, VFCorp and Whistles. 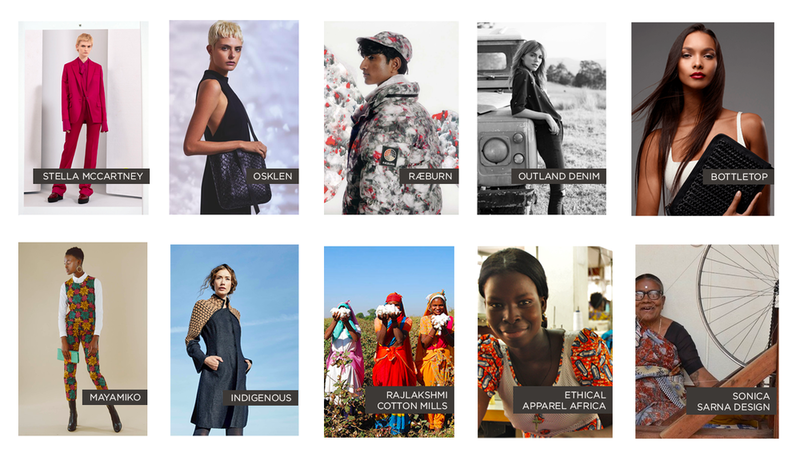 Ethical Apparel Africa (EAA) - A network of production facilities throughout Africa. Developing communities and enabling market access for African production. The Rajlakshmi Cotton Mills - The world’s first vertically integrated Fairtrade organic cotton supplier - from yarn to finished product. Leader of sustainable cotton production and manufacturing. There are more stories like this one …..